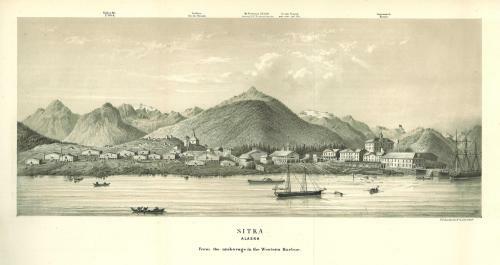 American soldiers arrived in Sitka in October of 1867 to take possession of Russia’s claims in North America. The Army pulled out a decade later, leaving Alaska first to the U.S. Treasury Department, and then to the U.S. Navy. Alaska finally got a civil government in 1884, after 17 years of American occupation. 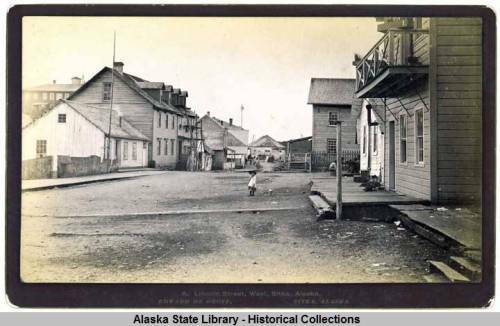 That first decade saw the complete transformation of Sitka from Russian colony and Tlingit village to American town. What is the legacy of that decade in Southeast Alaska, today? When I read documents from this period, the first surprise to me is how integrated Tlingit people were into the economy. Americans here in 1867 bought furs and food from Tlingit people and hired them for labor, and did not remark on it being at all unusual. The main industry in the region was the fur trade, which began in the mid-1780s with Europeans and Americans buying sea otter furs from coastal peoples. The Russians came to southeastern Alaska in the 1790s, after hunting out the sea otter farther west. The sea otter were soon hunted out here, as well, and the trade continued in other, less valuable furs. The Russian American Company was a fur trading business, chartered by the Russian government to rule Russia’s North American colonies. They were always short of manpower and resources, so they had to work with the indigenous Tlingit people in order to stay in southeastern Alaska. Most of the profits in the fur trade went to intermediaries, especially those who could control the markets to other tribes. Southeastern Alaska is separated by mountain ranges from the interior. The clans who controlled trade routes to the interior at Chilkat in the north, and up the Stikine River at what is now Wrangell, became wealthy and powerful and their leaders well known. The fur trade was not all positive; for one thing, new diseases, especially smallpox, decimated indigenous populations here as elsewhere in the Americas. Even though indigenous people participated in the economy, they did not control it as they had in the days before Europeans came to the continent. In the 1850s settlers, entrepreneurs, and miners poured into the Pacific Northwest, to what are now British Columbia and Washington State. Tlingit traders soon bypassed the Russians and took their furs over a thousand miles by canoe to Victoria to trade. Thousands of Native people, including Tlingit people, travelled to Puget Sound to participate in trade and to work at farms, sawmills, and mines. Indigenous residents of British Columbia and Washington, in spite of their economic relationships with the settlers, were being systematically dispossessed. The British Navy enforced “gunboat diplomacy” in coastal British Columbia, and in Washington the military forced all Native people onto reservations. Authorities responded to Native violence with disproportionate force. In southeastern Alaska, the situation was different: in 1855, Tlingit warriors attacked New Archangel, killing several Russians. Instead of retaliating against the Tlingit, as the British Navy or U.S. Army would probably have done, company officials blamed the Russian governor for allowing relations to deteriorate. The Russian American Company regularly paid Native people compensation for deaths and injuries, even when accidental. They were complying with the Tlingit system of justice, which could be a life for a life, but with the Russians was negotiated as material compensation. In 1856 the USS Mississippi fired on a group of Tlingit people at Port Gamble, in Washington. One of those killed was a Tlingit clan leader from Kake, a village in southeastern Alaska. When his relatives did not receive compensation for the death, they went to Puget Sound the following year and murdered the Collector of Customs on Whidbey Island, as a person with comparable status. They then returned to Russian America. Another indication of their relative autonomy was in keeping the Hudson’s Bay Company (HBC) from interfering with their trade. Tlingit clans pushed the HBC to abandon trading posts up the Stikine River in 1838, at Taku in 1842, at Wrangell in 1843, and on the Yukon, above Chilkat, in 1852. Tlingit control of southeastern Alaska ended with the transfer in 1867. American traders took over the southeastern Alaska trade, and miners, backed by the military, broke the monopolies at Stikine then at Chilkat. In addition, the fur trade was in a slump from overhunting and because of a depression in Europe and the United States. Politically, the change was more dramatic. American authorities considered Native people “savages” and inferior. They endeavored to put down “insolence” and to teach them to be “peaceful” and subordinate. American authorities refused to recognize Tlingit justice, even when complying would have been expedient and would have saved American lives. In early 1869, the Army at Sitka refused to compensate relatives for accidental deaths of two men from Kake. The relatives then murdered two whites. The USS Saginaw then shelled and burned all but one of the 29 clan houses of the Kake villages. A similar incident happened at Wrangell when the Army would not compensate for the death of a Tlingit man and a relative killed a white trader; the Army then shelled the village of Kaachx an.áak’w. The poverty that resulted from being forced to the fringes of the economy was attributed to Native incompetence, and used to justify continued discriminatory treatment. In 1877, when the Army left Sitka, Tlingit residents briefly regained some power, and began taking down the stockade. Tlingit people even forced a local merchant to pay compensation for a death. In 1879, a Tlingit clan leader demanded compensation, and wages owed, for the accidental deaths of clan relatives working on a whaler. The company wouldn’t pay, and he threatened to kill five white merchants. At that point, some white residents called for protection, and after a British warship was the first to reach Sitka, the U.S. sent the U.S. Navy to rule. By the end of the 1870s, the economy of southeastern Alaska was picking up: the first canneries were built in 1878, and the first commercial cruise to Glacier Bay came in 1882. 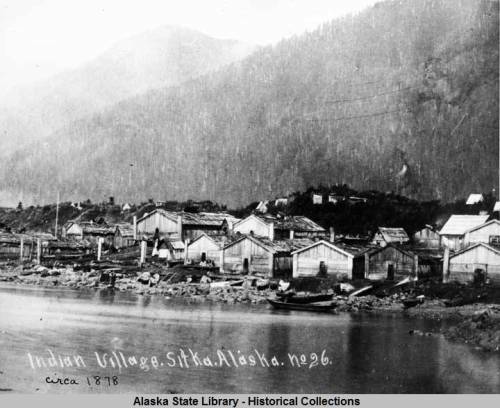 A gold strike in 1880 at what is now Juneau brought several thousand people to Alaska. These new industries, however, only included Native people as laborers and producers, and took Native land and resources. In 1882, the USRC Corwin destroyed most of the village of Angoon, again resulting from a dispute over compensation for accidental deaths. This time the action was condemned; there was no longer any perceived need to subdue Natives with force. By the time of 1884 Organic Act, patterns were set of land ownership, industry, and government that continue to the present day. Another legacy of this period is the cumulative impact of being considered savages, undeserving of citizenship or equal status in law. The second surprise for me, in reading the words of Americans in 1867, is how much of the early stereotype survives today. Even today, patterns of poverty and health are taken as evidence of inherent difference, instead of as the results of generations of unequal treatment. Perhaps the major legacy of this period is the stereotype. The history of this decade, and the regional and historical context, should be common knowledge. Without it, racial bias will continue. Native people know what their parents and grandparents experienced; when society at large recognizes and acknowledges the inequality, we can use it to address the challenges we face today. Rebecca Poulson is an artists, writer, teacher, and historian. She serves on the Alaska Historical Commission, on the board of the Alaska Historical Society and Sitka Maritime Heritage Society. She is currently working on a book about the history of Sheldon Jackson College in Sitka, Alaska. House of Representatives, Executive Document, Number 125, Fortieth Congress, second session, 1-8 (General Rousseau’s Report). “Acquisition of Alaska” Daily Alta California, Vol XIX, Number 6457, November 19 1867, accessed at the California Digital Newspaper Collection, https://cdnc.ucr.edu. Delavan Bloodgood, “Eight Months at Sitka,” The Overland Monthly, February 1869, 175-186. Captain George F. Emmons, The Journal of the USS Ossipee, Transcription by John M. Baldry, Elizabeth Richardson and Damon Stuebner, accessed at http://alaskahistoricalsociety.org/wpcontent/uploads/2016/12/Ossipee-Journal-Transfer.pdf. Petr Aleksandrovich Tikhmenev, A History of the Russian American Company, trans. and ed. Richard A. Pierce and Alton S. Donnelly (Seattle: University of Washington Press, 1978). Nora Marks Dauenhauer, Richard Dauenhauer, and Lydia T. Black, editors. Anóoshi Lingít Aaní Ká / Russians in Tlingit America: The Battles of Sitka, 1802 and 1804 (Seattle and London: University of Alaska Press and Juneau, Alaska: Sealaska Heritage Institute, 2008). Kenneth N. Owens with Alexander Yu. Petrich, Empire Maker: Aleksandr Baranov and Russian Colonial Expansion into Alaska and Northern California (Seattle and London: University of Washington Press, 2015). Andrei Val’terovich Grinev, The Tlingit Indians in Russian America, 1741-1867 trans. Richard L.Bland and Katerina G. Solovjova (Lincoln and London: University of Nebraska Press, 2005). Katherine L. Arndt and Richard A. Pierce, A Construction History of Sitka, Alaska, as Documented in the Records of the Russian-American Company, 2nd Edition (Sitka, Alaska: Sitka National Historical Park, National Park Service under Cooperative Agreement with the Department of Anthropology, University of Alaska Fairbanks, 2003). Ilya Vinkovestsky, Russian America: An Overseas Colony of a Continental Empire, 1801-1867 (New York and London: Oxford University Press, 2014). Golovin, Captain-Lieutenant Pavel Nikolaevich, The End of Russian America: Captain P. N. Golovin’s Last Report, 1862. Basil Dmytrishyn and E. A. P. Crownhart-Vaughan, translators (Portland, Oregon: Oregon Historical Society, 1979). Robert M. Utley and Wilcomb E. Washburn, Indian Wars (Boston: Houghton Mifflin Company, 1977). Barry M. Gough, Gunboat Frontier: British Maritime Authority and Northwest Coast Indians, 1846-1890 (Vancouver: University of British Columbia Press, 1984). Clarence R. Bolt, Thomas Crosby and the Tsimshian: Small Shoes for Feet Too Large (Vancouver: UBC Press, 1992). Susan Neylan, The Heavens are Changing: Nineteenth-Century Protestant Missions and Tsimshian Christianity (Montreal, Kingston, London and Ithaca, New York: McGill-Queen’s University Press, 2003). Peter Murray, The Devil and Mr. Duncan (Victoria, British Columbia: Sono Nis Press, 1985). 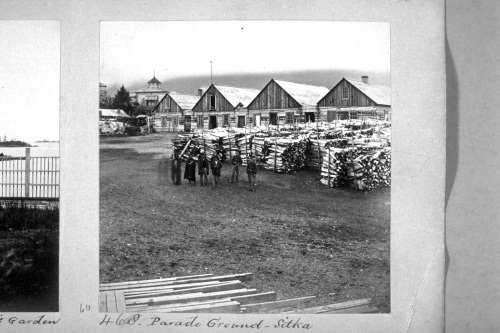 Letters and documents from National Archives, Department of War, Record Group 393: Records of United States Army Continental Commands, Records of the Department of Alaska 1867-1870 and Records of the Post of Sitka, 1867-1877. Reports by General Davis in Congressional Reports of the Secretary of War, including 1446, H.R. Doc 13, 41st Congress 2nd Session, 1870, 59-62. Frank Mahoney, “Letter from Frank Mahoney on the Indians and their trade in Eastern Alaska,” Appendix F in Vincent Colyer, Bombardment of Wrangel, Alaska, Report of the Secretary of War, Secretary of the Interior, and Letter to the President (Washington, D.C.: Government Printing Office, 1870). Vincent Colyer, Report of the Commissioner of Indian Affairs, Made to the Secretary of the Interior, for the Year 1869, 586-587. Stanley Ray Remsberg, United States Administration of Alaska: The Army Phase, 1867-1877; A Study in Federal Governance of an Overseas Possession, University of Wisconsin, Madison, PhD Dissertation, 1975. Zachary R. Jones, “’Search For and Destroy’: The US Army’s Relations with Alaska’s Tlingit Indians and the Kake War of 1869,” Ethnohistory, 60, no. 1 (Winter 2013), 1-26. Zachary R. Jones, “The 1869 Bombardment of Kaachx an.áak’w from Fort Wrangell: The U.S. Army Response to Tlingit Law, Wrangell, Alaska” Sealaska Heritage Institute and National Park Service American Battlefield Protection Program, in collaboration with Wrangell Cooperative Association, City and Borough of Wrangell, 2015. Bobby Dave Lain, North of Fifty-Three: Army, Treasury Department, and Navy Administration of Alaska, 1867-1884, University of Texas at Austin, PhD Dissertation, 1974. Donald Craig Mitchell, Sold American, The Story of Alaska Natives and Their Land, 1867-1959 (Fairbanks: University of Alaska Press, 2003). Sergei Kan, Memory Eternal: Tlingit Culture and Russian Orthodox Christianity through Two Centuries (Seattle and London: University of Washington Press, 1999). Sidney Harring,”The Incorporation of Alaska Natives Under American Law: The United States and Tlingit Sovereignty, 1867-1900″ (1989). CUNY Academic Works,.http://academicworks.cuny.edu/cl_pubs/326. John Muir, Travels in Alaska (San Francisco: Sierra Club Books, 1988). Aurel Krause, The Tlingit Indians, Results of a Trip to the Northwest Coast of America and the Bering Straits, trans. Erna Gunther (Seattle: University of Washington Press, 1956), 230. Ted C. Hinckley, Alaskan John G. Brady, Missionary, Businessman, Judge, and Governor, 1878-1918 (Miami, Ohio: Miami University, 1982) 25-73. In re Petition of Can-Ah-Couqua, 29 F 687 (1887), The Federal Reporter: Cases Argued and Determined in the Circuit and District Courts of the United States, Volumes 29-30, accessed at books.google.com.